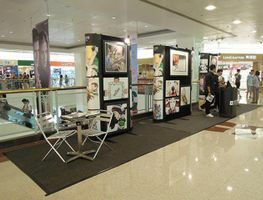 Located steps from the Diamond Hill MTR station, this 257 square foot pop-up shop is available to rent for your next pop-up store, art opening/exhibition or other short-term promotional event. The space is located on the first level of a trendy shopping mall that receives high foot traffic. This space is modern in style with white ceilings, tiled floors and white walls to seamless break the monotony. It is handicapped-accessible and is complete with toilets and lighting. Noise restrictions are in effect due to its presence within a shopping mall; elevators are available for quick load-in. A great venue for your next short-term event!